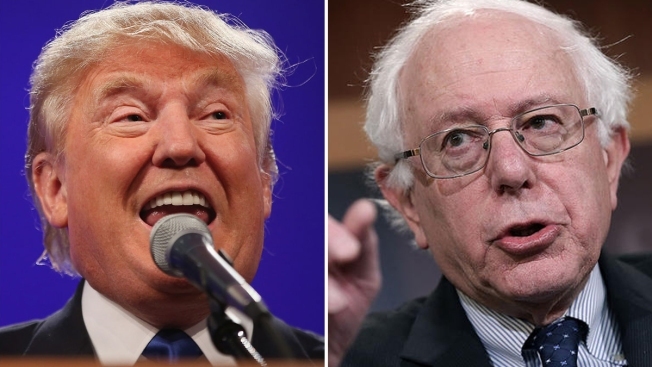 Poll: Trump, Sanders Still Leading in N.H.
Donald Trump, left, and Bernie Sanders, continue to lead in the polls in New Hampshire. A new poll shows that Republican Donald Trump and Democrat Bernie Sanders continue to lead big in New Hampshire. A Boston Herald/Franklin Pierce University survey released Tuesday has Trump leading the Republican field at 33 percent, followed by Ted Cruz at 14 percent, John Kasich at 12 percent, Jeb Bush at 9 percent, Marco Rubio at 8 percent and Chris Christie at 7 percent. Among Democrats, Sanders leads Hillary Clinton 55 percent to 39 percent, with Martin O'Malley a distant third at just 2 percent. The New Hampshire primary will be held on Feb. 9.